Business Service Management (BSM) is a methodology for monitoring and measuring Information Technology (IT) services from a business perspective. How to use Oracle Enterprise Manager Grid Control for it? If you are curious with this question. I mentions book titles "Oracle Enterprise Manager Grid Control 11gR1: Business Service Management", It was written by Ashwin Kumar Karkala, Govinda Raj Sambamurthy. 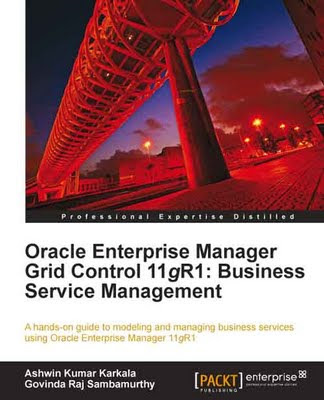 This book will help you to use OEM Grid Control 11gR1 for Business Service Management. You will learn OEM concepts such as Targets, Metrics, Alerts, Beacons, Service Tests, and so on. You can read Sample chapter.